Cascading waterfalls hidden in a forest, towering cliffs over pristine blue water, a rolling field of lavender… Yes, I love to travel and visit the natural wonders all around world. But there’s something beautiful, also, about the stark contrasts and clean lines of skyscrapers reaching above you and the hustle of people crowding the streets. And when it comes to urban landscapes, Chicago is one of my favorites. 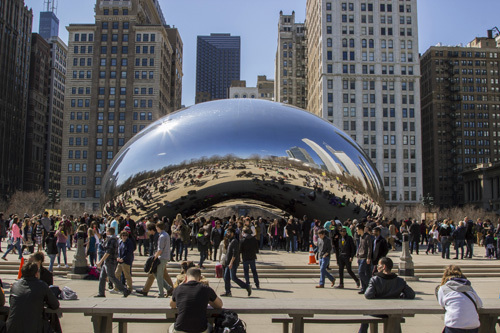 I spent a too-short weekend celebrating Easter just outside of the Windy City, but I made sure to take an afternoon trip downtown. 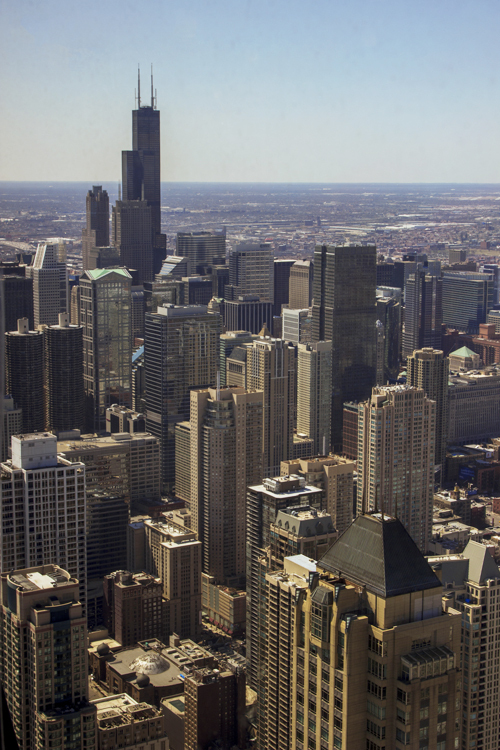 I met a friend in the lounge on the 96th floor of the John Hancock Center to soak in a birds-eye view of the city before hitting the streets to capture my favorite sights on camera. 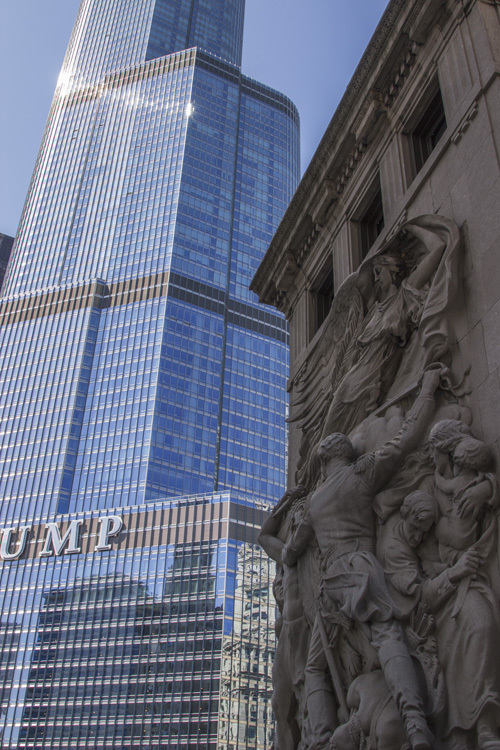 My favorite photo-op of Chicago is at the river. The buildings look so grand rising above the water, and you can marvel at the mixture of architecture. 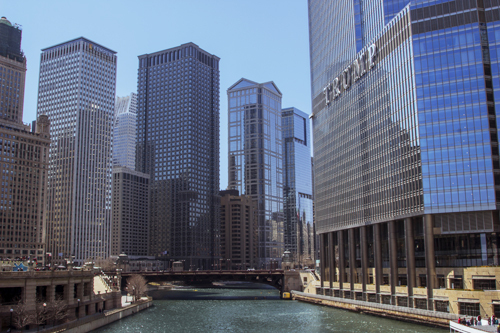 Old meets new: the old staple of the corncob-shaped Marina City stands its ground across from 77 West Wacker (formerly known as the United Airlines Building, a personal favorite) and the sleek new Trump tower. 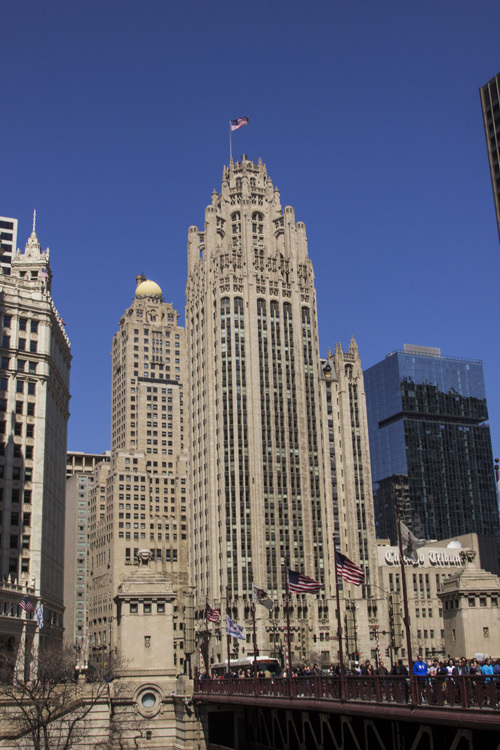 Turn your gaze north of the river and the neo-Gothic Tribune Tower beckons visitors to cross the street for a closer look. 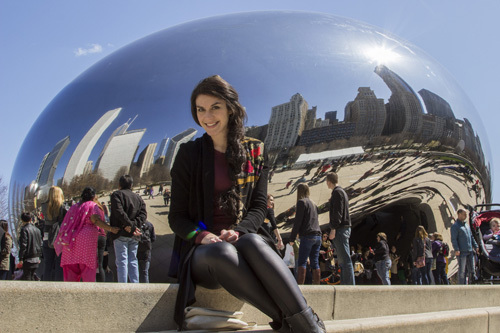 A trip to Chicago wouldn’t be complete without finding the best angle to capture the Bean. 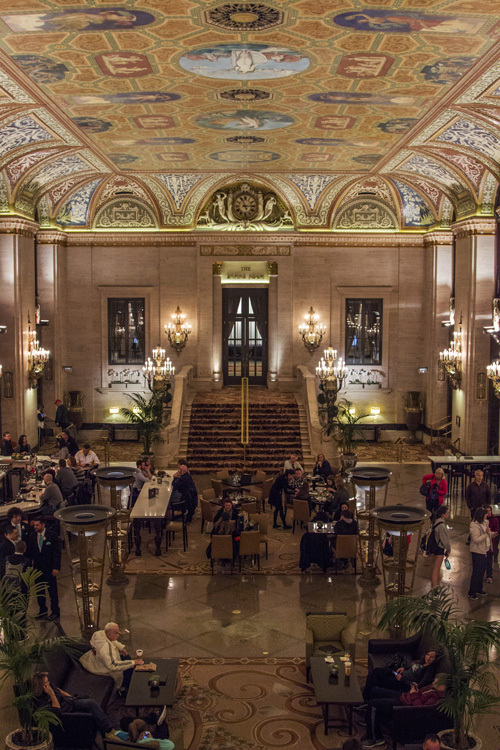 From there, I walked up Monroe Street to revel in the lobby of the Palmer House, now a Hilton hotel, which is a wedding location dream and features a ceiling of Grecian frescoes by Louis Pierre Rigal. 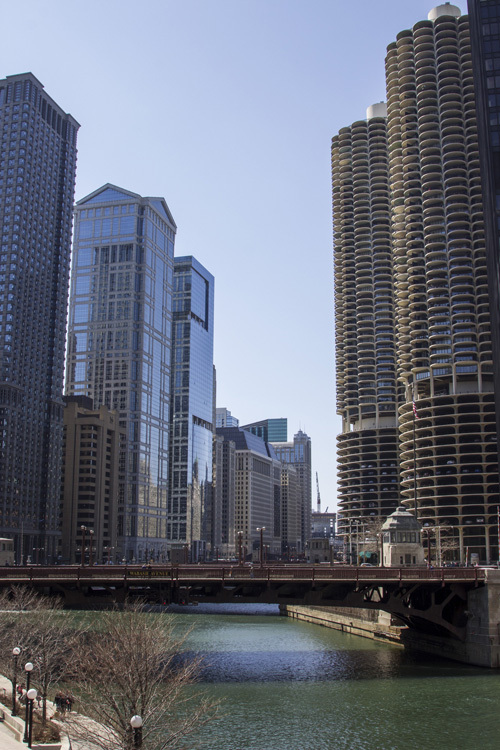 Take a look at some of my favorite shots of Chicago, and let me know what else I need to check out next time I’m in the Windy City! FOOD! You failed to mention the food! Hot dog stands, pizza, italian beefs…. 🙂 I grew up in the suburbs and 1 of my grandparents live in the city. Carol, I learned from my mom that the best way to explore a city is to eat your way through it! Unfortunately, on this trip I just snacked and had family dinner in the ‘burbs. But of all the times I’ve been to Chicago, can you believe I’ve never had deep dish pizza? Do you have a favorite? Honestly the only deep dish I have ever had was Giordanos (yum and you can find in the burbs) . Connie’s pizza isn’t deep dish, but it’s pretty darn good! I hear that Ginos East is good too. Have you ever gone to Edebevic’s? Its a restaurant where the waitresses talk back to you and dance on the bar. They dress like the fifty’s and sixty’s. It’s a family place. Its fun! What burb is your family in? You mentioned waterfalls and I can’t think of any that would have any! Thanks for the recommendations! We were in Oak Park for most of the weekend. And no, definitely no waterfalls or lavender fields around there haha.